So I got this sample as part of my SpaceNK goodie back from their summer shopping event. I have to admit I was really excited to try this, Eve Lom is a brand I’d heard about and thought it would work even better than my Origins Rescue mask! Even the sample packaging looks fabulously luxurious! It is a clay based mask with bits in. It requires A LOT of shaking to get it mixed to produce a decent consistency that you can spread across your face. That was my only frustration with the application – the shaking. If you didn’t shake it enough, a watery fluid came out and didn’t do much. So this is what I used in my face mask routine. 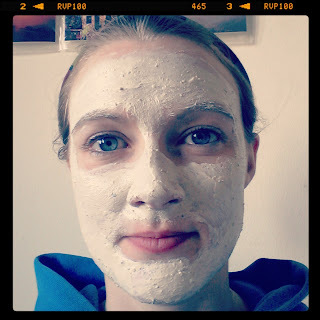 The Garnier face scrub to exfoilate my skin – I know Caroline Hirons would cry because it’s got bits in and it foams, but I use it once a fortnight (alternating with my Dr Jart exfoilator) and would like to finish the product! Next I apply the face mask for about 15minutes. 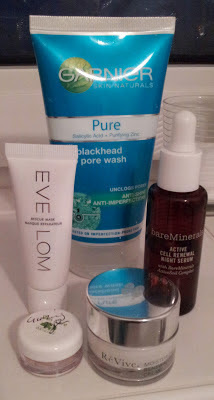 Once I’ve rinsed it off with a face cloth I dry my face, apply my Cell Renewal serum from bareMinerals. After my serum has sunk in a wee bit I apply my Origins Ginzing eyecream from Origins and followed that with my ReVive Moisturising cream. I should point out that I had used all the products bar the face mask on numerous occasions without problems! Heck I have used all of it daily except for the scrub! Anyway my skin had a few minor breakouts going on, so I was hoping that the face mask would bring these to a head and help them clear quicker – similar to my Origins Rescue mask. Well it would seem I was going to be sorely disappointed. A rather lovely picture of me with the mask on! I tried this mask on two occasions – on both occasions I had a few minor break outs, the second occasion my skin was in really good condition apart from a few small spots that were coming up around my mouth/chin area. Both times this mask made my skin noticeably worse – I developed spots in areas that my skin was really good in fact! There were no underlying spots that I could see and generally I was pleased with it. So the first time I thought maybe I had left the mask on too long, so the second time I only left it on for 10 minutes. I used the mask almost 4 weeks apart. After the second time, my skin became really really irritated. I got a chorus of wee red spots – they didn’t have a head on them and looked more like bites. I got some on my forehead – which is a rarity for me. My skin looked worse, not better. I was distraught! I reduced the amount of products I was using in the hope that this would help my skin. I did do my Rodial snake mask a couple of days later, this helped. My Emma Hardie cleanser helped – I used it morning and night, I also made sure to use my Cell Renewal serum as this always helps irritation on my skin. I think a combination of my good skin care items helped but just not quick enough, this went on for about 4 days and it was gradually getting better but just not quick enough. I purchased the Dr Jart gentle exfoilator and the La Roche-Posay Effaclar Duo, as soon as I got home I used both and my skin became so much better within hours. Thank God! I know this mask works really well for some people, but it seems to have got over-excited on my skin and irritated it a lot. I do have slightly sensitive skin, but I have never had this reaction to a mask before in my life. Ever. I have used other deep cleansing masks and never had this reaction. So I would recommend getting a sample of this before purchasing the full size, it’s not exactly cheap at £35 for 50ml at SpaceNK. This is my experience only, I just thought it worth sharing so you are aware that it isn’t necessarily suitable for everyone.